Great modern Mediterranean redesign. When the folks of Daze Design Studios saw this modern Spanish style estate home in Maitland, they knew right away it had something special. They took on a large scale remodel to give the house a new life. Neutral colors and an array of wood tones gave the home a sophisticated but warm touch. 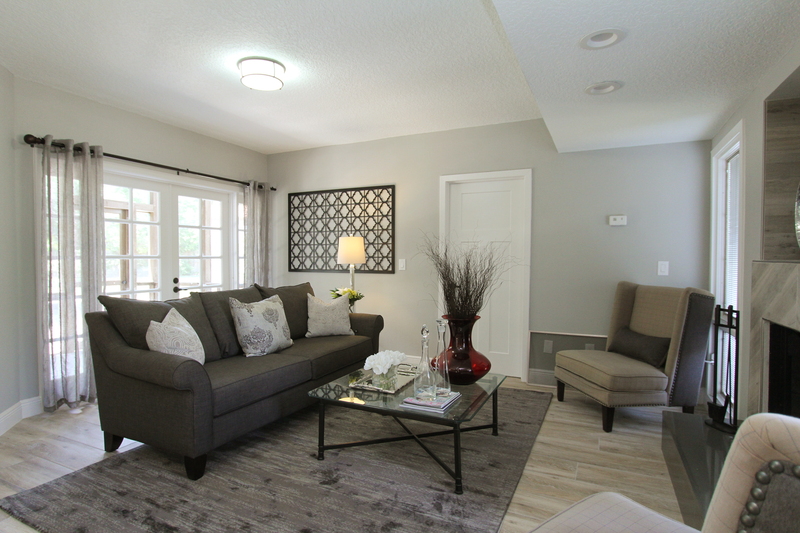 To finish it off the renovation professionals entrusted Helene Bonello-Strauss with the task to dress the house with a gorgeous staging. Helene took the color scheme and created a modern look that is sleek, while providing an atmosphere that asks the visitor to linger, to stick around. The comfortable furnishings showcase the space while offering the perfect backdrop for entertaining. 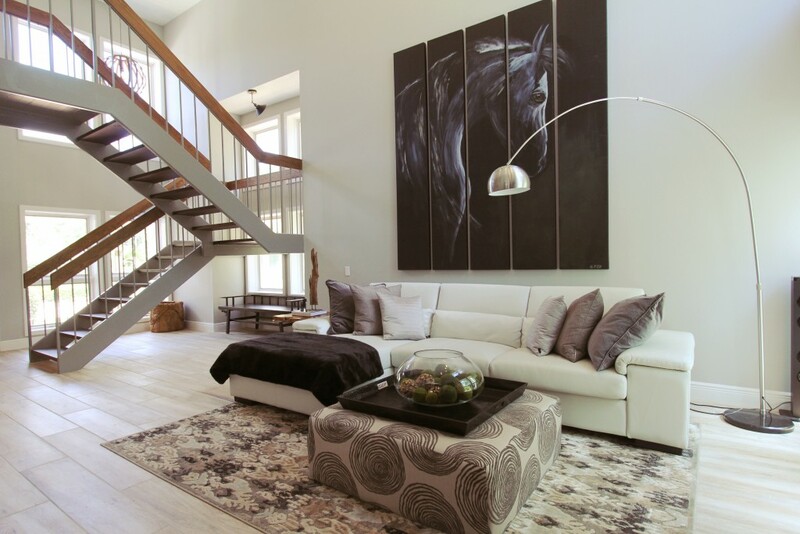 The modern sectional in the huge living space upfront was accented with a custom art piece, commissioned for the space. The painting named “dark horse” is acrylic on 5 wood panels and measures 8 feet high and 7 feet wide. The designer said that the space was overwhelmingly large and it took a very large art piece to make sense of the vertical space in the room. She wanted to draw the eye up so visitors would not just gaze at eye level but rather perceive the room in its entirety. The large sweeping staircase was the dominating factor and a small painting “would just have looked ridiculous in this space” so the designer. 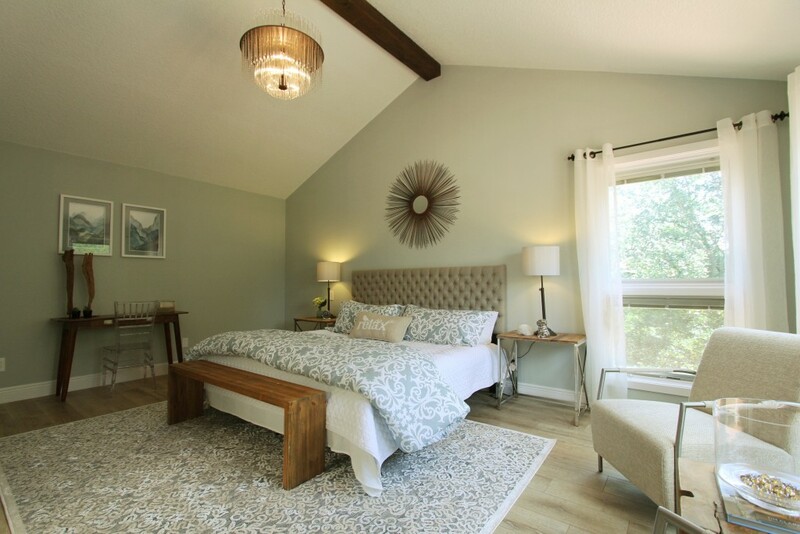 The master bedroom with its vaulted ceiling created some architectural drama. 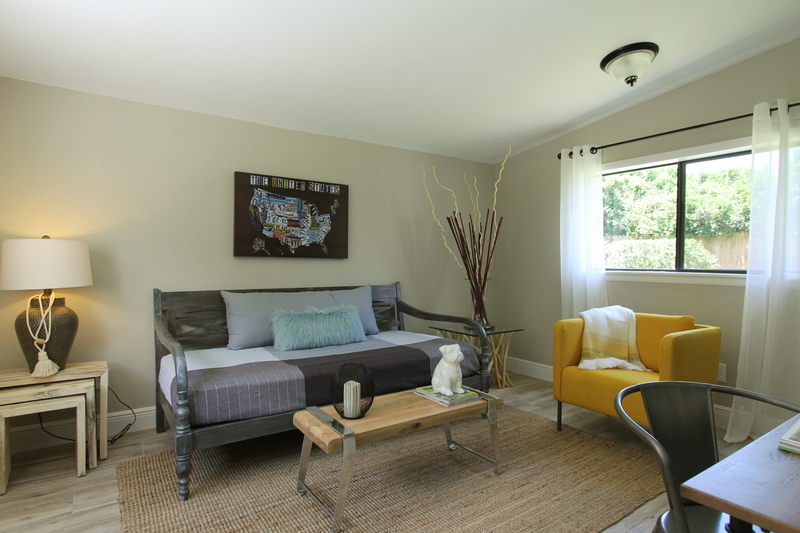 The simple lines of the bed and some accenting seating leave the room open enough for the full visual effect. The gorgeous remodel and the sophisticated staging design proves that 80’s architecture can be as current as one can imagine. The owner is thrilled with the outcome of the highly successful collaboration. “Helene surpassed our expectations in every way. We are so happy we hired her for the staging.” Fact is, when great minds have a similar vision for a final product the outcome will be fantastic. We are glad that we were able to be part of this success and wish Amy and Steve the best of luck with marketing this estate home. The first comments from the previewing visitors were raving. 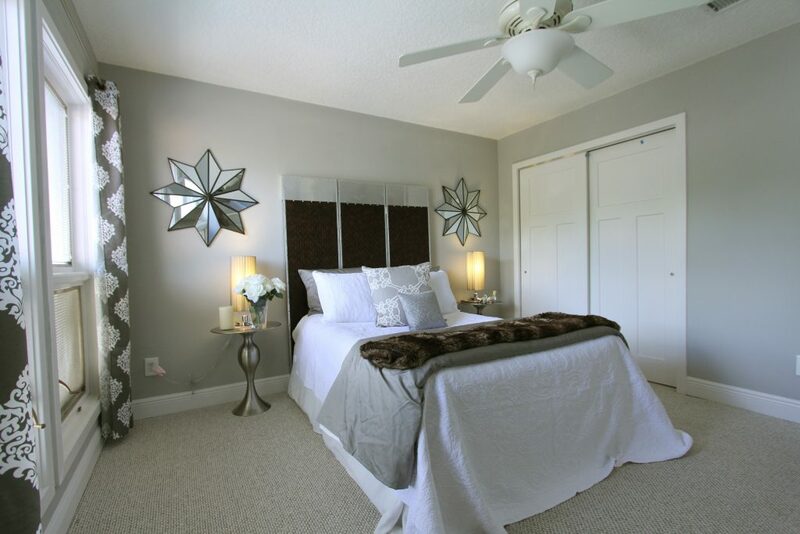 We are sure that this home will have no difficulties finding an owner who will enjoy living comfortable in style. The house is available for private showings. See the walk through video below. A guest house the is the ideal getaway. Who does not want to take a vacation in this tiny house? The family room has updated traditional lines. The wingchairs are a modern interpretation of a classic. 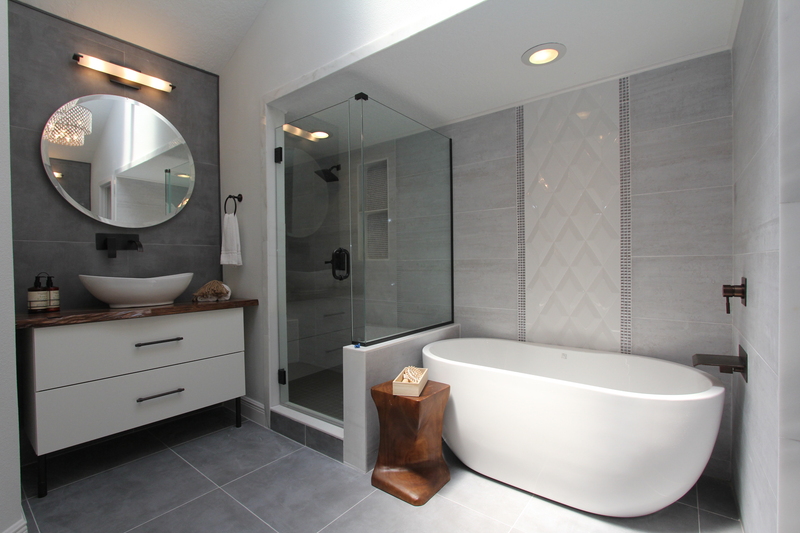 The master bath in its new form. clean and sophisticated.